This project concerned two large capacity (900 kW) water chillers which provide cooling for the building’s air-conditioning services. The chillers were approximately 10 years old, but were suffering from repetitive condenser failure, and were also the most significant load upon the building’s electrical supply. Working with the Client’s Consultants, Hilson Moran, ThermOzone were tasked to come up with a dual solution to both the reliability issue of condenser failure and also to show a significant energy saving. The former was achieved by replacing all aluminium extruded style condensers with conventional copper tube and fin condensers. The extruded condensers were introduced in the early 2000 to save both cost of materials and reduce refrigerant charge in the chiller, but unfortunately for many chillers they have proven insufficiently resilient, suffering from acidic corrosion from external contaminants notably traffic dirt. This site first experienced failures just after the original warranty and since had replaced numerous individual condenser panels year on year (each chiller has 14 condenser panels). Any panel leaking resulted in a substantial if not full loss of system refrigerant, so although the newer style uses less refrigerant in service, repetitive leaks mean a very expensive and non environmentally friendly chiller. Using R134a the refrigerant has a CO2 tonnage equivalency in Global Warming terms of ~ 1,430 /kg, so although not providing direct energy savings form this element of the project with some 80 kg per system, the CO2 atmospheric loss represents some 114,400 tonnes of CO2. This placed a huge onus upon the chillers owners and users to act effectively. However, during our preliminary discussions with the Consultants it became clear that these chillers were mostly lightly loaded, and as such were running with the compressors only at a partial load condition, with the specific load being controlled by an internal slide valve device, a simple mechanical slide which varies the amount of screw profile actually providing compression. Simple this mode might be, but efficient it is not. As soon as a compressor slide valve moves away from its optimum 100% full load position its operating efficiency falls away. Like many other industrial motors significant gains in efficiency can be achieved by applying inverter variable speed / variable frequency drive inverters to screw compressors. Use of the inverter allows the specific load to be controlled by shaft speed variation rather than moving the slide valve away from its optimum position at 100% (mechanical) capacity. attaining 50% of the efficiency at <35% slide valve load. 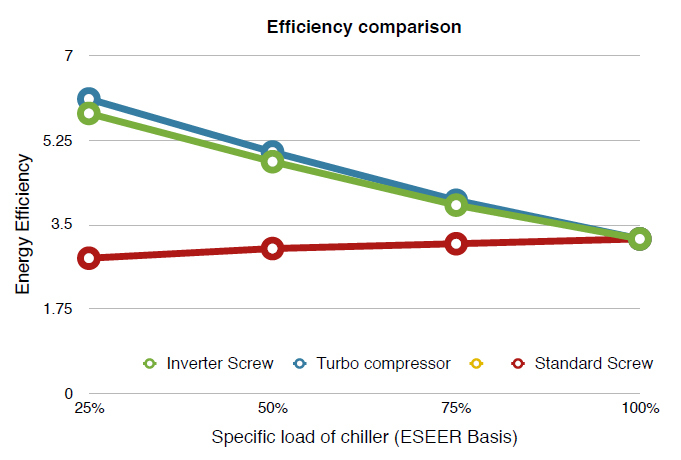 Comparing this with a speed controlled shaft from the same standard point, as the load reduces the efficiency markedly improves, indeed measured using the Building Regulations Part L formula for assessing Seasonal Energy Efficiency Rating (SEER) for water chillers the overall SEER generally improves from ~3.8 with a conventional slide valve screw compressor to ~4.8 with an inverter screw, or in energy saving % terms ~20% improvement. However, at partial load the energy savings become outstanding, with the specific EER of the slide valve screw reducing as low as 2.5, whilst the inverter screw can achieve as high as 6.0. Comparing these efficiencies shows an energy saving at minimum load >50%. In practice most chillers will spend over 90% of their operating time in the part load operating mode, and whereas this might not be at the minimum position typical savings on many UK sites where cooler conditions place us beneath the standard SEER curve prediction, we are seeing retrofit and new chillers utilising Inverter screw load control ~30 - 35%. When we looked closely into the option to retrofit the chillers to Inverter we studied the OEM manuals for both the chiller and specifically the model of compressor assigned. It was discovered the OEM had designed these compressors with slide valve load control also to be used with VFD Inverters. So it was then simply a case of sizing the appropriate capacity inverter, and re-designing the controls with a strategy to suit. Because the original controls had no feature to allow for inverter mode load control this meant we had to replace the main chiller controller as part of a package of works. However, because we were able to retain the original compressors, the full retrofit cost was quite reasonable and certainly complied with a decent payback requirement. Since the project was concluded in early 2017 to the second chiller we have seen consistent energy savings throughout the operating seasons. The original primary reason for the project has been completely successful with the use of conventional condensers. 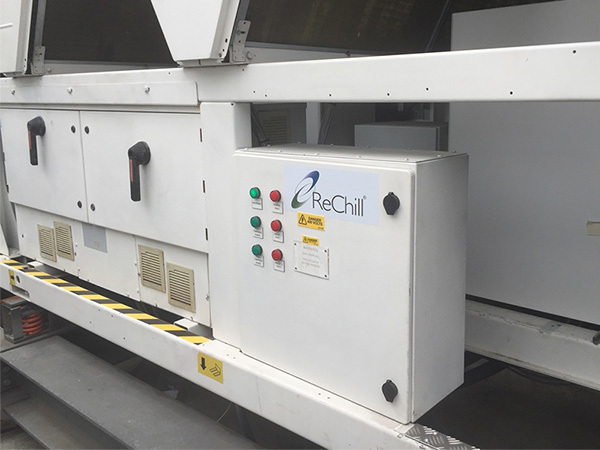 ReChill® has proven modern chiller efficiency can be achieved on most older chiller frames using robust Screw compressors and modern Controls. However, screw compressors, albeit far more efficient on these applications than piston compressors, themselves have a load efficiency weakness, whereby at partial load the internal load control ‘Slide Valve’ reduces energy efficiency progressively below 100% load (displacement volume), with efficiency falling rapidly below 60% slide valve / swept volume at low external load. So effective seasonal load control to satisfy modern demands for an effective SEER / ESEER (efficiency rating) is a crucial area where innovation is very necessary. Proven energy savings of Screw compressors replacing Piston compressors provides an energy saving closely linked to the lesser pumping efficiency due to cylinder & valve losses of the piston compressor compared with the screw equivalent displacement – e.g. circa 25 – 35%. However, at lower load settings (for most chillers ~ 70% of their annual operating cycle), the Screw compressor is not optimised, with the slide valve modulating the load below its optimum efficiency. With VFD Inverter control the Slide Valve is held at full load position, optimising the screw compressor at its most efficient. By simply slowing it to match the chilled water cooling demand (the load), the specific efficiency increases, because with slower internal gas flow-rates, internal pumping losses are reduced, with less blow-by of compressed gas across the screw rotor tips. Maintaining the oil lip sealing is simpler as the slower motion is not dragging the oil as much as at higher speeds, although the minimum speed is limited by the requirement for sufficient low – high pressure differential to maintain sufficient oil flow to the screw mechanism and bearings. Preliminary measurements indicate the Inverter control will improve part load operating efficiency by as much as a further 30%, and overall it is anticipated the running energy saving will be above 50% all round compared with the original piston compressors. A considerable benefit is the very low start current from the ‘Soft Starter’ feature of the Inverter.